We are happy to be a part of this wonderful giveaway for our Mother"s Day Event! Thank you, Beautiful Incentives! I am a certified lip balm addict. It is one of those few addictions that don't cause harm except for maybe overly soft lips. I love all kinds, fruity, floral, bakery and herbal infused. I don't buy just any any lip balms though. I am very picky about what I choose and they have to contain the best, most healthy ingredients. 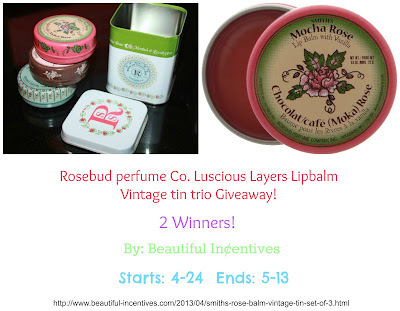 This is what Rosebud offers in their unique line of lip smacking good balm. I received this lovely set of Vintage Luscious Layers lip balm tins from Rosebud perfume Co. filled with the unique flavors; Mocha Rose, Brambleberry Rose and Menthol & Eucalyptus. These lip balms give you a very slight tint bringing out your natural color. Let me first rave about the tins. I picked these for their vintage appeal and they could not have been more perfect. I love these and they really do scream throw back vintage with these stylish designs. Rose bud has since made their tins a lot easier to open and I am not complaining. It doesn't bother me one bit to use my fingers and I like how much they hold. I also love the economical efficiency of these tins and they will last forever. There is so much to use. The tin that carries them is just adorable too. I love the dainty flower looks and this whole set really gets me in the spring time mood. Rosebud lip balm is well loved by many, including my friends. They rave about it for it's extremely emollient properties and scents. It has been around for centuries. They started out with their popular rosebud salve and they flourished into a world of different flavors and scents. My favorite being the brambleberry. It is on the fruity and vanilla scented side, which I love. 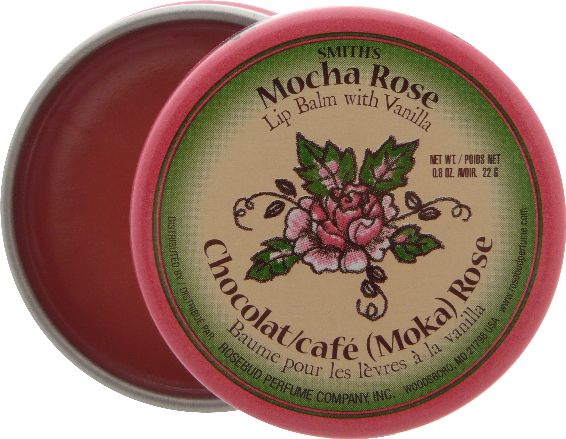 The mocha rose is my second favorite, a really nice blend of subtle chocolate mocha and floral. The menthol and eucalyptus is great for chapped hurting lips in the winter and will wake your sinus's up with it's powerful scent. Whether you just want to soften your lips or they're chapped, this lip balm does a great job for both issues. It is a bit on the oily side, but doesn't bother me. It may for some of you. Slather it on at night and wake up with gorgeously soft lips or put it on before your lipstick for a dewy look. Some of the balms can actually be used for other parts of your body. Take a look at their unique list of uses here! Now I know what all the raving was about. I am thoroughly pleased with the new tins, their formula and scents and highly recommend that you try them out for yourself. Rosebud has been around for so long and these are the obvious reasons why! You can find Rose balm for $7 or less at many different stores all over. Check out their website for a full list. I received this product for the purpose of review and was not given compensation. This is 100% my opinion from my own experience. Your opinion may differ. This blog is not responsible for prize fulfillment. US and Canada Entries Only! 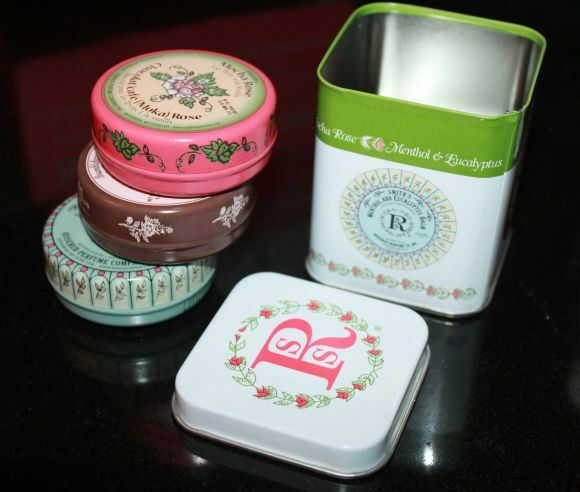 Those tins are oh so pretty--I would want to re use them for something once the lip balm was used up!! Totally agree about the tins they are wonderful. The Brambleberry Rose sounds gorgeous. I used to always buy lip balm in tins. I never see that anymore. I will have to check out this site. I keep lip balms everywhere--in my purse, in the car, in the bathroom. I love the tins the Vintage Luscious Layers come in. They'd make great gifts or party favors too! I love tins so would love these. I collect them for various things. Thank you for the giveaway. the tins look cute and pretty. i love lip balms too. It must be nice. I might want to try the new products. Lip balm are one of my collections. Sounds like some great products to try and I love those containers!